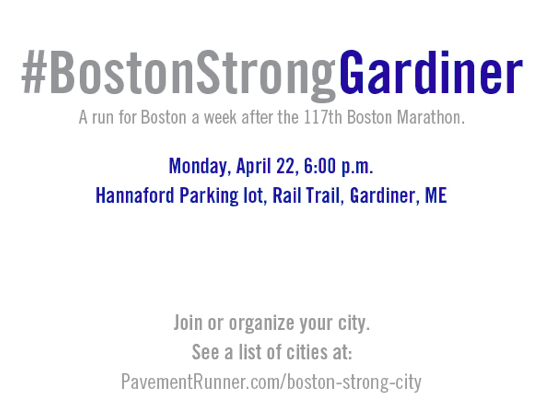 My blogging friend at Pavement Runner has started a global event for #BostonStrong runs to take place in cities globally. Knowing my city and many surrounding towns had many runners who ran the Boston Marathon this past Monday and many of those runners had family members at the race - the Boudreau family included, I knew I had to organize a run/walk for our city. This gathering is not just a run. It's a community gathering for runners and walkers alike to join together in remembrance of the Boston Marathon tragedy, to honor those who lost their lives, those who lost loved ones, those who suffered from injuries, those who are still fighting for their lives, the first responders, the B.A.A., the city of Boston, and all runners and walkers. Who: Anyone who wants: Runners, Walkers, Dogs, Strollers. This is a family friendly event. Why: A tribute from our town to Boston. If you'd like to wear blue and/or yellow, feel free to do so, but it's not required. I look forward to seeing you there! If you cannot join us that night, please run virtually wherever you are. 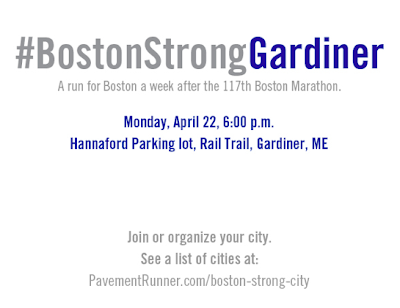 And to see a complete list of the #BostonStrong runs (and walks) - please go to Pavement Runner's blog. Im in, itll be a walk but I'll be doing it!! Ah it was today. Well crap. Ill be walking first in the morning for it!! !